A light/dark sensing circuit is extremely useful and versatile in a wide range of renewable energy projects from automatic lighting to security systems. In our article Light Dependent Resistor we explained how an LDR can be used in simple circuits to control devices according to the ambient levels of lighting – for example, automatically turning on a lamp above a doorway at nighttime. The circuits provided in that article were very basic and therefore not without their problems. The main problem is that the automatic turn-on is not sharp – i.e. rather than switching the lamp on fully as soon as ambient levels of light fall to a fixed point, the lamp turns on slowly getting brighter and brighter as light levels fall. This is not a serious problem when controlling a lamp – in fact it may even be desirable – however when controlling other devices (such as a night vision camera) it is not optimal. One way around this is to use a relay, however a typical 12 Volt relay draws 300-500mW of power – a significant waste of energy when a 1 Watt LED spotlight for example is to be controlled. Above is a schematic diagram of an LM741 light/dark sensor circuit (from the excellent 741 Op-Amp Tutorial by Tony van Roon). The ECG128/NTE128 transistor stipulated can be substituted with any NPN transistor rated at sufficient gain and current for the chosen relay coil. 1st Nov 2007 Update – We have modified the schematic diagram above with the addition of a 220uF smoothing capacitor between the base of transistor Q1 and ground. Without this capacitor, the relay chatter (relay switching on and off many times per second) was terrible around the switch on/off light level. By adding the capacitor, relay chatter was completely eliminated. According to the designer of this circuit, the relay will be closed only when “NO light falls on LDR1“, however, in testing this circuit proved to work very well with the user able to adjust the potentiometer (P1) to automatically close the relay at whatever light level they chose. By swapping the postitions of the 10K resistor (R1) and the LDR (LDR1), the relay will be closed when the LDR is under light rather than under darkness. Therefore a device can automatically be switched off at nighttime. Since this circuit still contains a relay we need to make some changes* to reduce the amount of power to make it more suitable for renewable energy powered low-current applications. * Where devices of more than a couple of Amps are to be powered, the energy loss in the relay becomes insignificant and so the above illustated circuit should be used as is. If more current is required – for example to power a string of LED spotlights – the transistor can be replaced by a MOSFET. 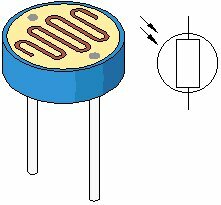 A MOSFET is similar to a transistor, but it can carry much more current. In our testing we used an STP36NF06 MOSFET since that’s what we had lying around. Since the vast majority of people do not have the necessary expertise and equipment to put together one of these circuits, we are happy to put one together for you according to your exact needs. The MOSFET version of the circuit (suitable for maximum total output currents of 2 to 3 Amps) is now available from the REUK Shop and is pictured above. 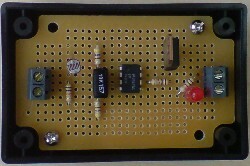 Click here for more information and to make a purchase: Light/Dark Sensor Circuit (Low Current). NEW – We now also have the relay version of the circuit (suitable for maximum total output currents of 10 to 12 Amps) and it is also available in the REUK Shop: Light/Dark Sensor Circuit (Relay). If you require a bespoke light/dark sensor circuit – for example, one which activates in light rather than in darkness contact neil@reuk.co.uk directly with details of your requirements. Prices start from around £10 per circuit including all components.